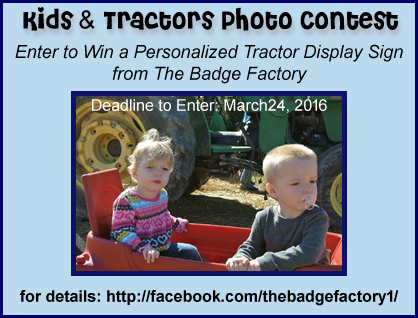 Enter to Win Our 2016 Kids & Tractors Photo Contest! Step 2 – In the comment section below the contest poster on our Facebook page, add a photo of at least one child with an antique tractor. Please include the tractor year, make, and model. The tractor must be 1980 or older!! Children in the photo must be 18 years of age and younger. There can be more than one child in the photo. Adults may also appear in the photo. In order for the photo to qualify, there must be at least one child and an antique tractor. Step 3 – Invite all of your Facebook friends to vote for your antique tractor, by “liking” your comment with your photo . Deadline to enter is Thursday, March 24, 2016 at 11:59 p.m. EST! Last day to vote is March 27, 2016. After we review all the votes, the winners will be announced on Wednesday, March 30, 2016. First Place Winner receives a Custom Engraved Magnetic 5″ x 8″ Tractor Display Sign. Second Place Winner receives a Custom Engraved Magnetic 4″x 8″ Tractor Display Sign. Third Place Winner will receive a Custom Engraved Magnetic 3″ x 6″ Tractor Display Sign.